Zach Johnson celebrates a birdie on the 18th green during the second round of the 147th Open. He already has a Claret Jug to his name but the Johnson on top of the leaderboard at the halfway stage of The Open is not the one most people were expecting. 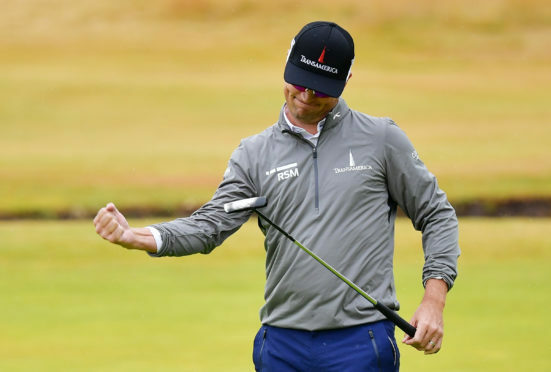 While world number one Dustin crashed out of the tournament after finishing six over par, the 2015 champion golfer of the year Zach stormed to the summit with a four-under 67 for a six-under total on a wet and windy day at Carnoustie. It should be no surprise that the 42-year-old is tied for the lead alongside fellow American Kevin Kisner. Zach Johnson is something of an Open specialist. The two-time major winner has finished no worse than 16th in six of the past seven Opens. He has made the cut 12 times in a row – a feat no other player at Carnoustie this week has achieved. But he has become accustomed to casual golf observers assuming it is the other Johnson when he makes it into contention in the majors and on the PGA Tour. He said: “I’ve been called Dustin many times. I doubt he’s been called Zach that many times. “Maybe some people assume when they see the name up there, that it’s Dustin. How many tournaments has he won, 18? It is probably a safe assumption. “I certainly am not the number one player in the world that ends in Johnson. “What Dustin has done over the last few years is remarkable. “I don’t know if I’m under the radar or overlooked. That is not for me to say. There can be no confusion, however, on Johnson’s love of links golf and The Open championship. He said: “The main reason is because I feel like this championship more than any tournament completely magnifies exactly what I need to work on, my strengths and my weaknesses. “I’m not suggesting someone doesn’t have a higher reverence for this championship and specifically the Claret Jug but I’d argue with them. “I greatly appreciate how the game was formed over here and how this championship came into fruition back in 1860. “I love and embrace everything about it. “I’m not going to sit here and say I love playing in the wind and rain because I don’t but I can do it. First-round leader Kisner started the final hole with a two-shot lead before a costly trip into the Barry Burn resulted in a double bogey. But the 34-year-old refused to be downbeat after rounds of 66 and 70 for a six-under total after 36 holes. He said: “I didn’t think I would hit that in the burn with an 8-iron but the ball just didn’t come out the way I expected. “I hit a lot of great putts coming down the stretch. I probably could have made two or three more but they all lipped out. Tommy Fleetwood, Pat Perez and Xander Schauffele are one shot behind the joint leaders with Rory McIlroy and Matt Kuchar among the group on four under. World number one Dustin Johnson was among a host of big names who failed to make the cut. Sergio Garcia, Jon Rahm and Bubba Watson also missed out.